I remember few years ago, there were some discussion in the internet among Leehom's fans to list 1 thing of Leehom that was considered "not perfect". And the only 1 thing I agree immediately was... his big nose! Oh yeaa... Leehom has a big nose. Fans said it was like his father. Well, I have never seen his father's pictures, but I know his mother doesn't have a nose like him.. so I guess fans were right. Nobody is perfect. I think it's cool that Leehom fans understand that pretty clear. They discussed Leehom's "flaw" freely and openly without afraid of hurting each other. And more importantly, they way they love and respect Leehom, didn't put them inside the irrational blind idol's worship things. So, don't sue me for saying that your nose is big, okay Leehom?? Take it as a compliment :) I always think people with round nose (like yours) to be more friendly and more approachable rather those with sharp nose. Moreover, Chinese said, you're lucky when you have a big nose, that would mean you have more blessings in life. I dont know.. maybe because with your big nostril you'll be getting more oxygen that the others ? LOL!!! 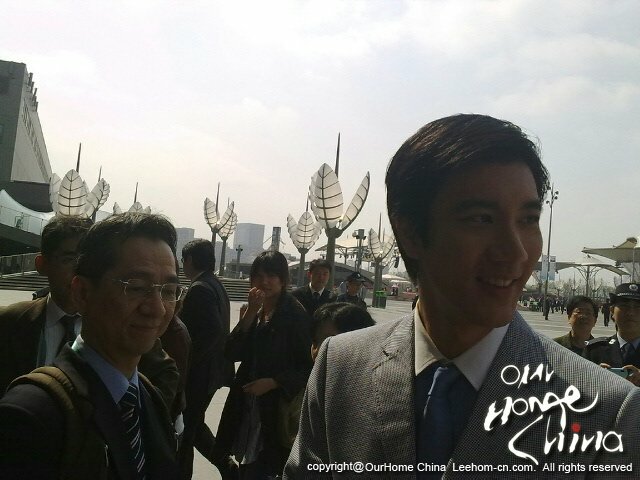 Picture was taken when he was visiting Shanghai World Expo, 1 May 2010.